Slated to hit stores on 6/12, Tech N9ne Presents Stevie Stone – Rollin’ Stone is already getting a big reaction out of Strange Music fans everywhere. The album’s official pre-order went up recently and offered fans an exclusive deal that includes an autographed copy of Rollin’ Stone, an exclusive t-shirt, a full color sticker, and a bonus free download of the unreleased track, “In The Game”. With so much anticipation and features from Tech N9ne, Yelawolf, and Hopsin, fans on the web couldn’t help but share their excitement and support. 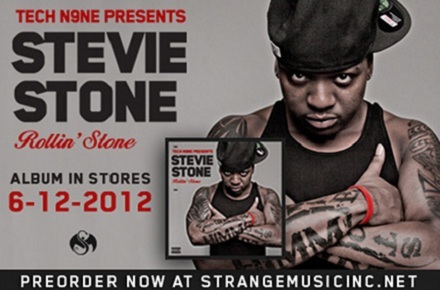 Click here to pre-order your copy of Tech N9ne Presents Stevie Stone – Rollin’ Stone.